Yum! Yes, yet another soup. 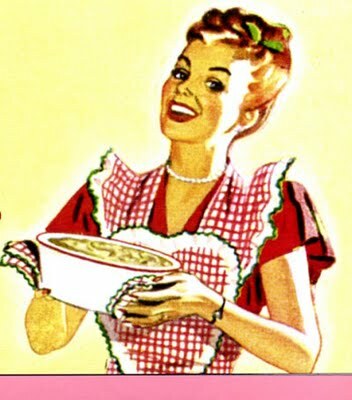 That’s what I have always maintained I make a lot of soup. 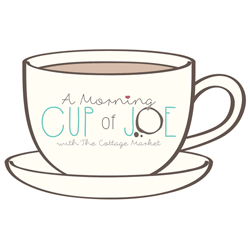 I love it and it is ssoo good for you. It is quick to make, delicious without any effort. If you are smart you will make enough to last you 3-4 days. That way in a pinch you have a meal without any effort. No not leftovers! 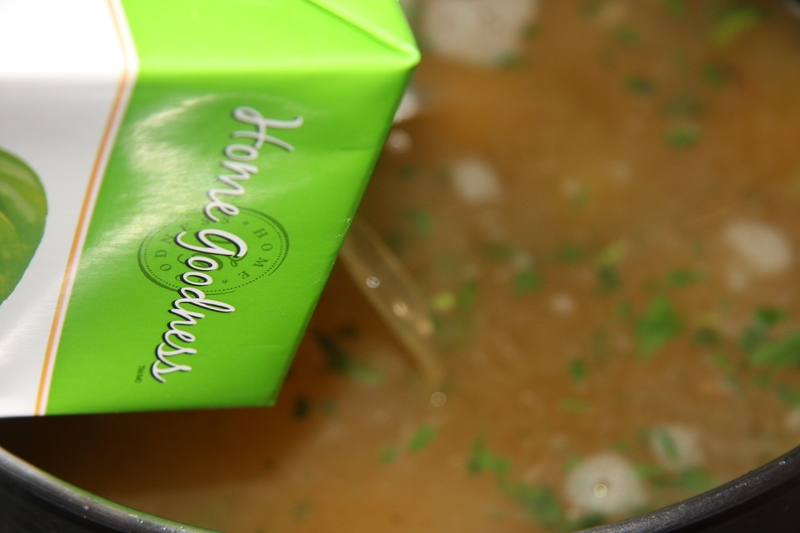 Soup is always, always better the day after you make it. More flavor. So how can that possibly be leftovers? If you have the room in a freezer, then at the end of the summer you could load up on veggies like this squash, freeze it and your good to go for the winter months. So really it is very reasonable in cost to make. Not only can you freeze the veggies, you can also once made the soup freeze it and have soup whenever you want already made. A great time saver if done this way. 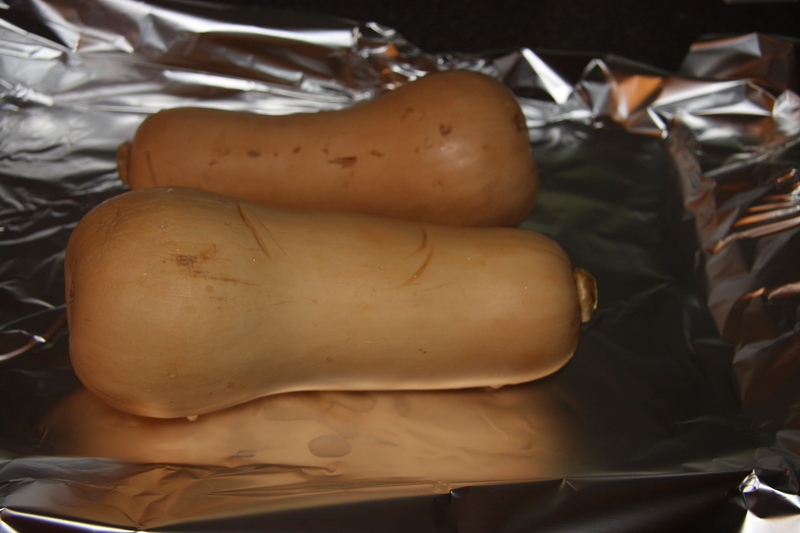 Onto a foil lined pan, for easy clean up, place your washed squash. 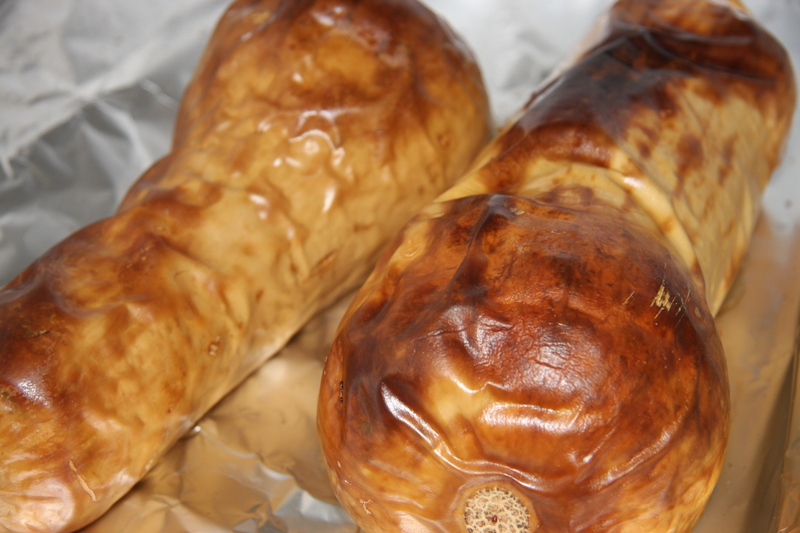 Bake for an hour or until squash is soft. Remove the skin and seeds. Set aside. 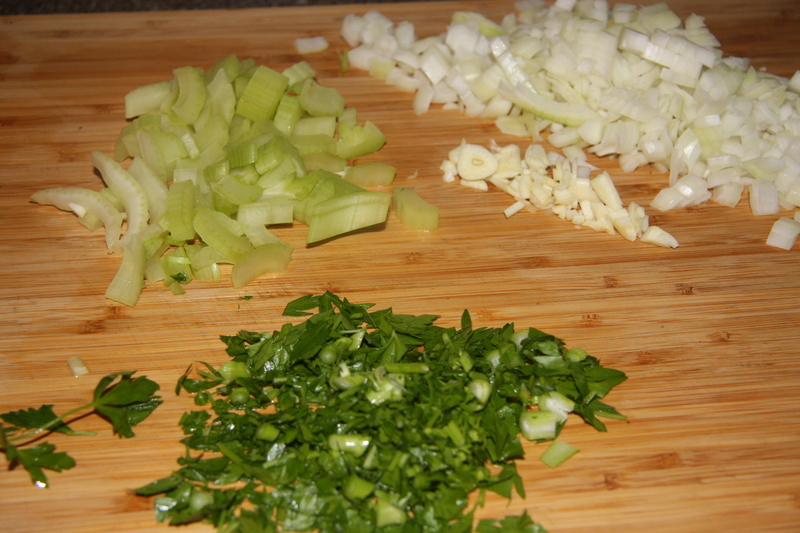 Chop 1 rib of celery, 1 onion, 1-2 cloves of garlic and some parsley. And don’t forget to cube one potato, like I almost did. 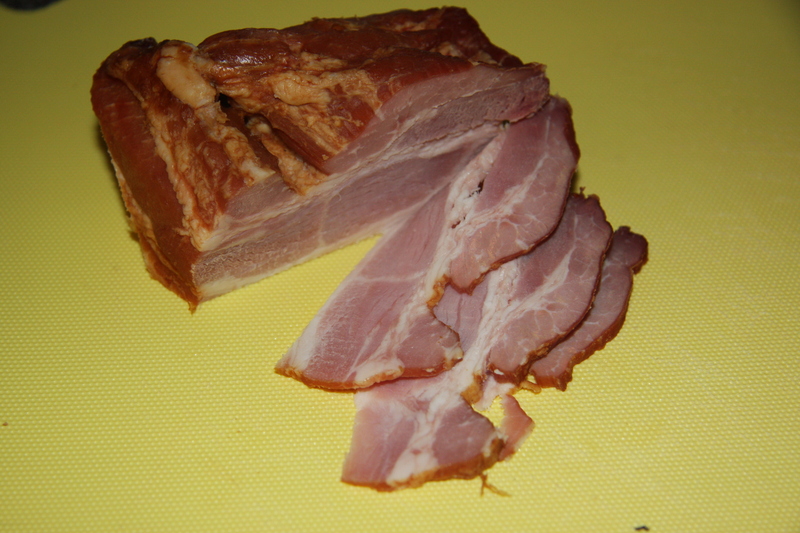 This is a smoked bacon I buy at a local deli. It is really good and adds a wonderful flavor. I slice it myself then cube it for this soup. Into a stockpot heat some olive oil. 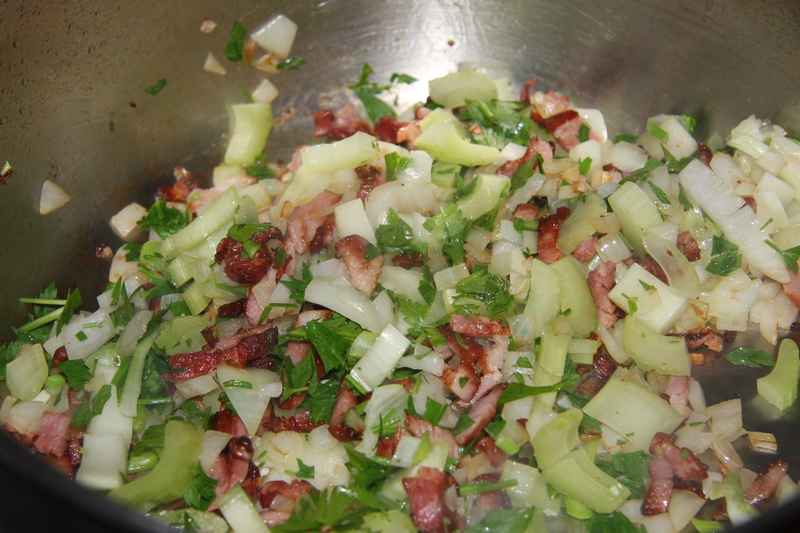 Add the bacon and fry until it is browned. Remove some for the topping of the soup bowl if you want. Next add onions, garlic and fry until onions are translucent This is a thing of beauty. Well actually anything with bacon is. 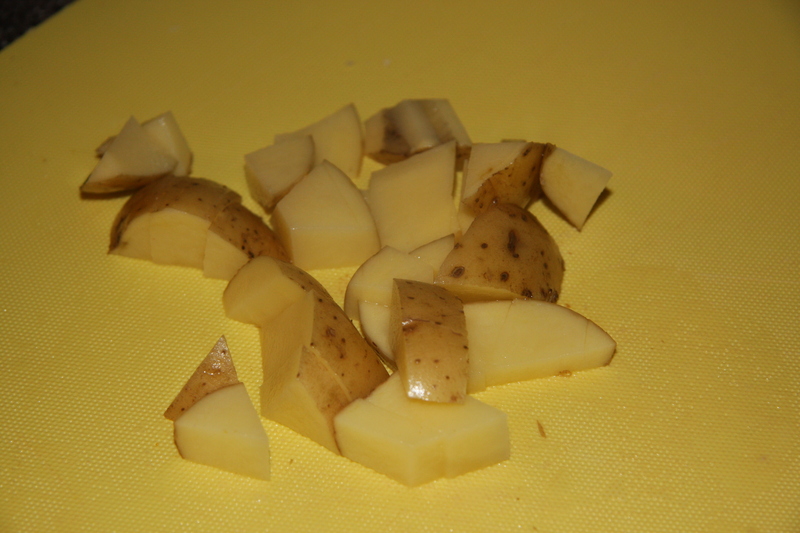 Whatever you do don’t forget that cubed potato, fry it for a couple of minutes then add about 1/4 cup chopped parsley. 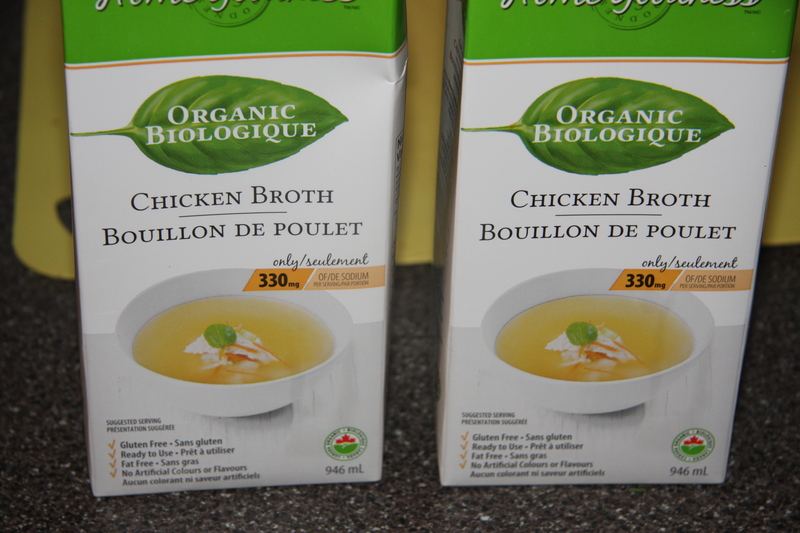 Boxes of chicken broth are great in a pinch. I don’t always want to make it from scratch. Next add the 2 boxes of chicken soup. And all the butternut squash that you scooped the skin off of. Fill the pot with boiling water. 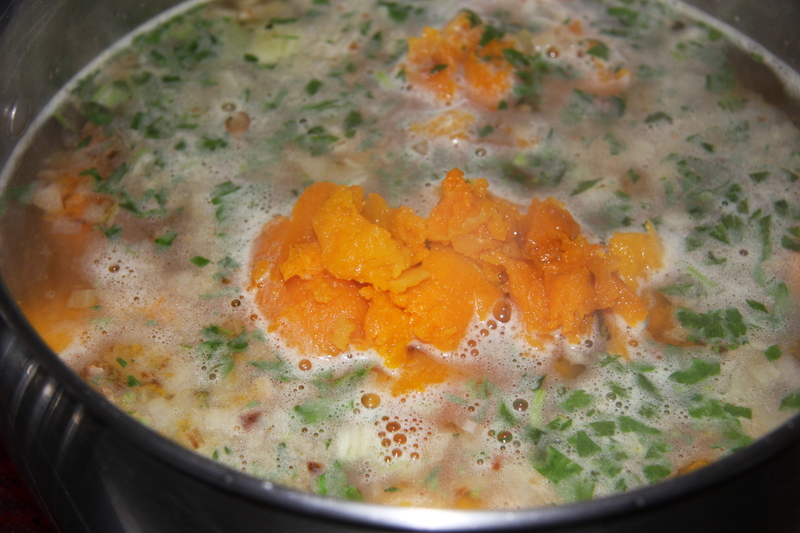 Bring all of the ingredients to a boil, reduce the heat and simmer for 30-40 minutes, partially covered. 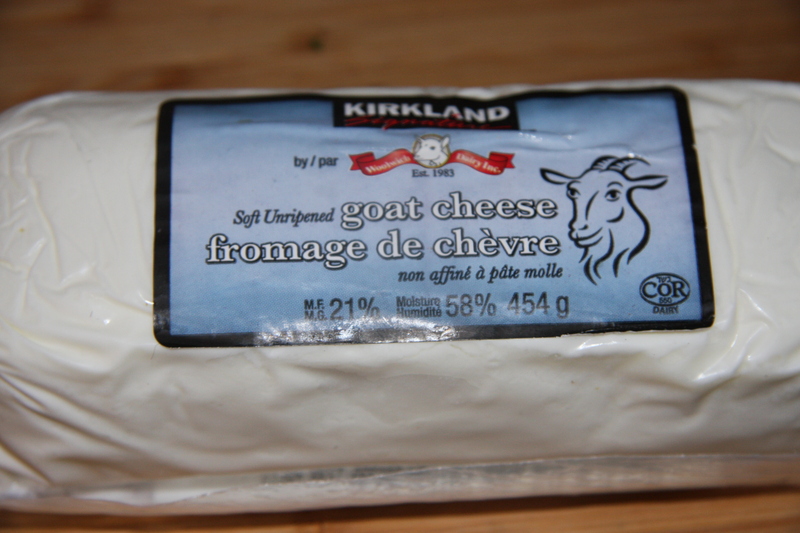 This is the goat’s cheese I use. From Costco. Love this stuff. 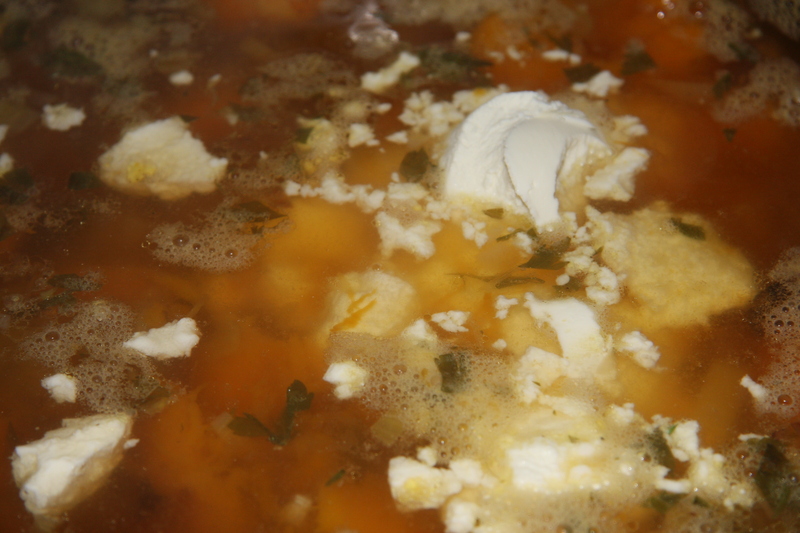 Add the 8 oz.of goats cheese to the simmered broth and veggies. Take the immersion blender, smooth and combine all the ingredients. 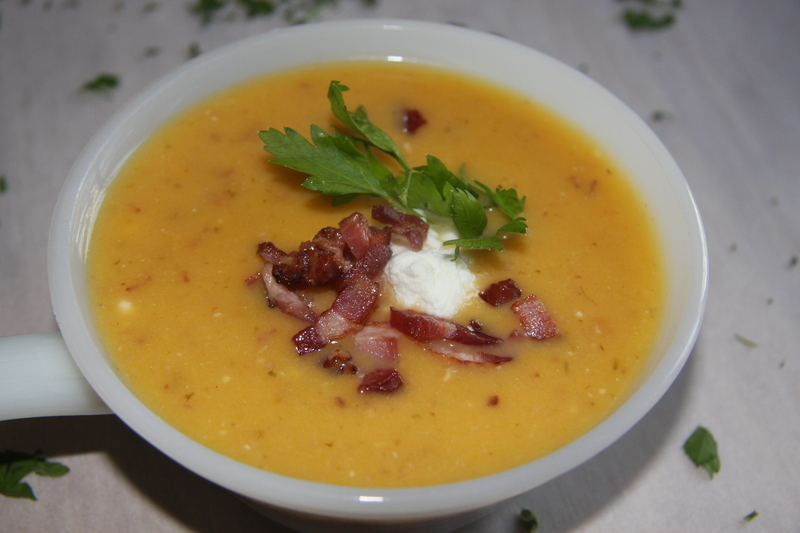 Place into a soup bowl, add a few lumps of goats cheese, a couple of teaspoons of bacon, a bit of parsley all in the name of presentation and there you have it. 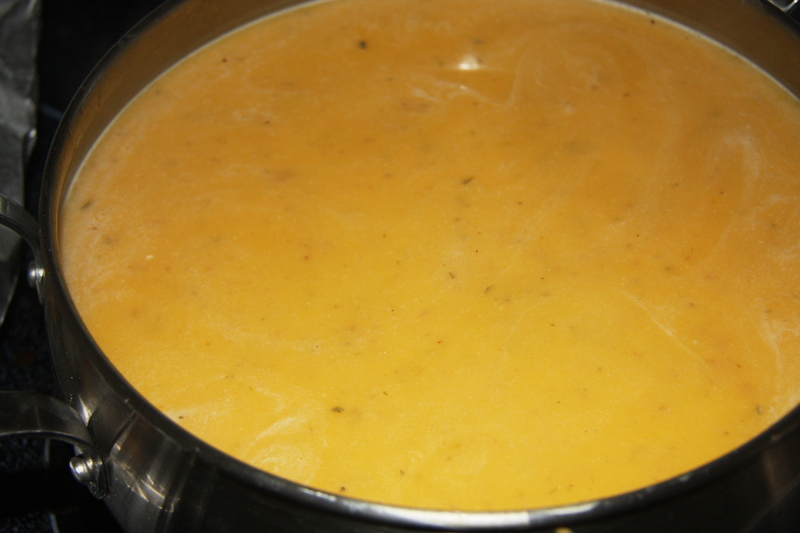 Roasted butternut squash soup. BIG YUM! 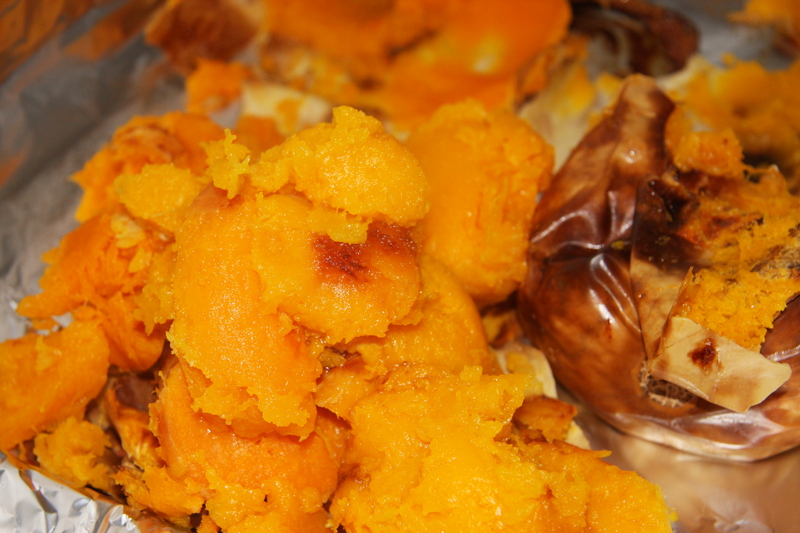 Bake squash on a foil lined pan until soft at 350 degrees. About 1 hour. Remove skin, seeds and set aside. Fry bacon until it has browned. Remove a bit for the top of the soup. Add onion, garlic and fry until onions are translucent. 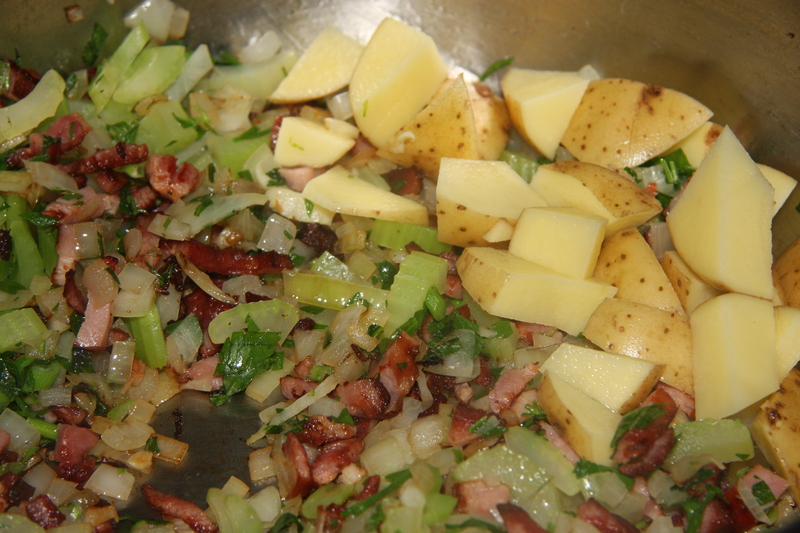 Next add celery and potato and fry for another minute. Add the chicken soup next bring to a boil, top with boiling water, reduce heat and simmer partially covered for 30-40 minutes. Next adding the goats cheese. 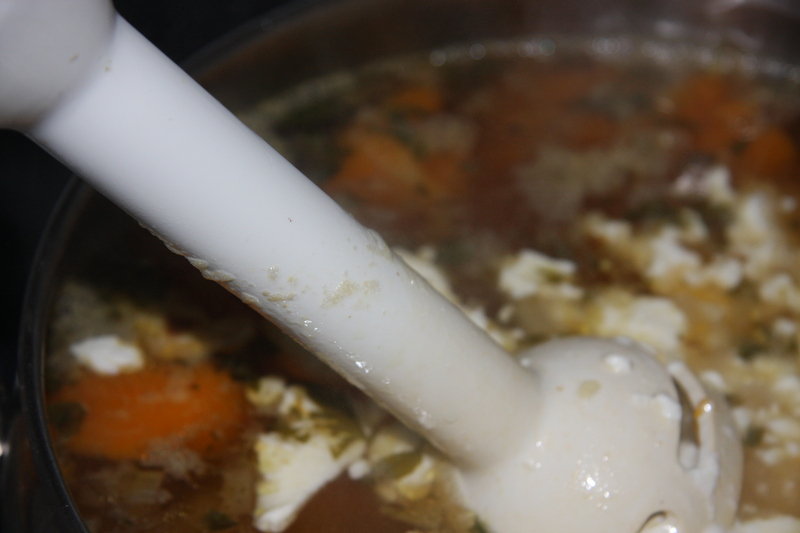 Take immersion blender and smooth out all the lumps and bumps. 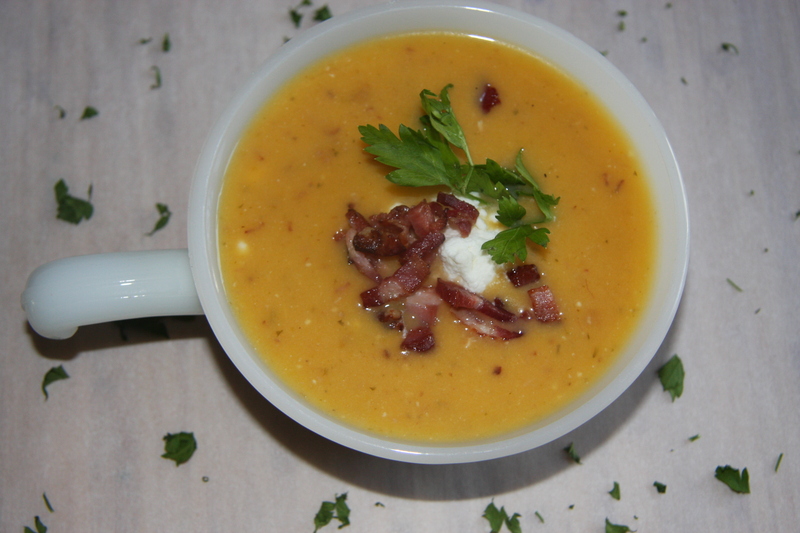 Place into a soup bowl and your meal is served.